There is nothing better than a cold glass of strawberry lemonade on a hot summer day. Well, I thought there wasn’t anything better until I had a slice of Strawberry Lemonade Cake. All of the same refreshing flavors, but in cake form. Count me in! 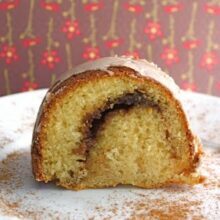 This cake recipe comes from my good friend Heather’s new cookbook, Generous Table. Heather’s book is filled with easy and elegant recipes that make entertaining simple throughout the seasons. We took the Strawberry Lemonade Cake to a dinner party and our friends loved it. It was the perfect ending to our dinner on the patio. I am not going to lie, layered cakes kind of intimidate me. I am always worried they will get stuck in the pan and my cake decorating skills are a little scary. The Strawberry Lemonade Cake sounded so good, I put my fears aside and got baking. I was determined to make this cake! The recipe was surprisingly simple. We had all of the ingredients on hand and the steps were easy to follow. And guess what? The cakes came out of the pan with no trouble at all! Yahoo! 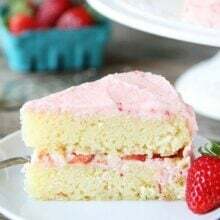 Now let’s talk about this lovely cake-two layers of tart lemon cake sandwiched between sweet strawberry buttercream frosting an freshly slice strawberries. Now you know why I HAD to make this cake. If you are looking for an easy cake to serve your family and friends this summer, make this Strawberry Lemonade Cake. It’s a dreamy dessert for summer…or anytime! 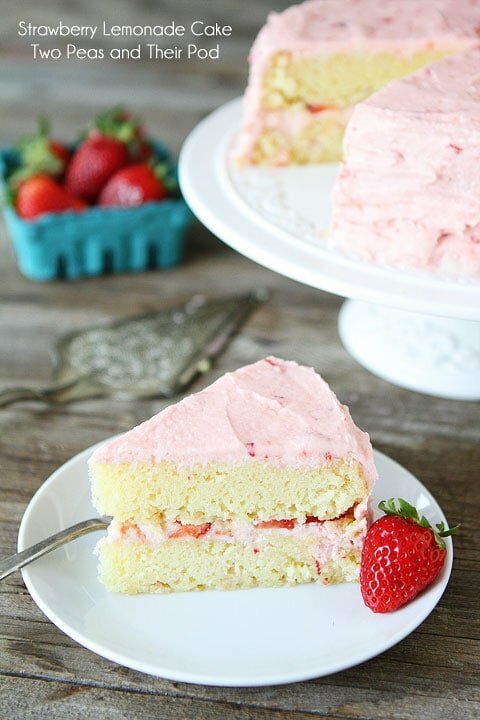 Tart lemon cake sandwiched between layers of sweet strawberry buttercream frosting and freshly sliced strawberries. This is the perfect summer cake! Preheat the oven to 350 degrees F and spray two 9-inch round baking pans with baking spray. In bowl of stand mixer fitted with whisk attachment, place the butter, sugar and lemon zest. Beat until light and fluffy. In a separate bowl, mix together dry ingredients and set aside. With the mixer on low speed, add the eggs, one at a time, combining thoroughly in between. With the mixer still running, add the lemon juice. (batter will look curdled, but it's not). Add one third of the dry ingredients and 1/2 cup of the buttermilk. Mix, then stop and scrape the sides of the bowl. Repeat, adding another third of the dry ingredients and the remaining 1/2 cup buttermilk. Mix, then stop and scrape. Add the remaining third of the dry ingredients and mix until completely combined and the batter is light and fluffy. Divide the batter evenly between the prepared pans. Bake the cakes for 25-30 minutes, or until a toothpick inserted in the center comes out clean. Let the cakes cool before removing from the pans. 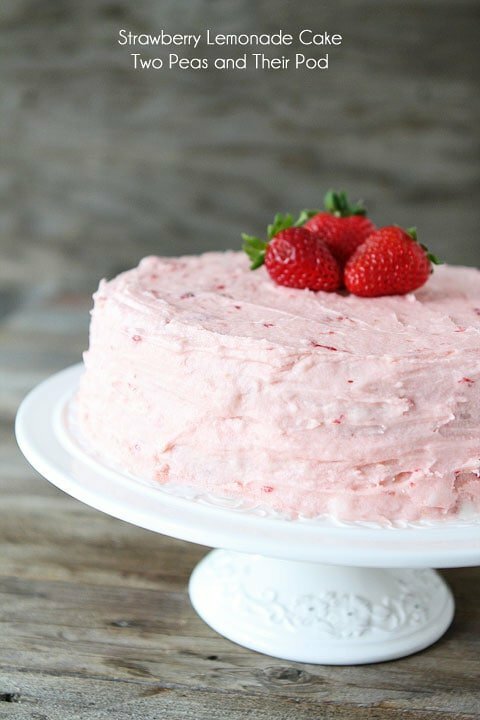 While the cakes are cooling, make the strawberry buttercream frosting. Combine the butter and powdered sugar in a large bowl or standing mixer. Mix together on medium speed until pale and fluffy, about 3 minutes. Add the milk and strawberries and mix on high speed until the frosting is very fluffy and pale pink in color, with flecks of strawberry. The cake is stunning and turned out beautifully! In the past I’ve made pink lemonade bars and strawberry cakes, but I love the sounds of a strawberry-lemonade cake. Mmmm, so good and it looks so moist. Pinned! Olala! Hard to go on a diet with such lovely cakes here! Such a beautiful cake with such a great sounding flavour! Beautiful cake! That frosting looks and sounds amazing. Perfect for the summer time. I love strawberries at this time of year. I love the flavour of this cake too. Good job with the presentation, it’s looks lovely. This looks wonderful.. such lovely colors. What a gorgeous cake!!! I love the flavors and the pretty pink color!! Such a fun and pretty cake! I little sister would go crazy for the pink color! This cake looks so pretty Maria! I really like how evenly you cut all the strawberries too, they look so mouthwatering delicious! Love the flavors of the strawberries and lemon together, sounds amazing! This cake sounds so flavorful and impressive yet so easy to make. All those fresh berries sound like such a great addition. I don’t know what you were scared of … you look like a cake pro! Totally brought on my cravings this morning. You should make layer cakes more often – this looks amazing! This cake wins the award for pretty, pretty, pretty! Imagine taking this to a party? Everyone would probably put you on their shoulders and cheer! You did a great job! I am totally intimidated by cakes too! Great looking cake and the title just makes you want to kick off your shoes and lay out in the garden with a giant slice of it!! This is one beautiful cake! Strawberries just scream summer to me! This looks so yummy….thinking about making it for my daughter’s birthday party. How tart is it? Would kids like it? Thanks! The cake is lemony but not overly tart because of the sweet strawberries and frosting! Looks fantastic! So refreshing, if cake can be refreshing?!! What a fantastic recipe and so perfect for summer. I can’t wait to try this, it looks delicious! This is SO pretty! I love strawberry and lemon together so much. I want that book! How many cakes did you make? I see three versions. Is the cake really lemony? I would want it to be tart and delicious! I only made one cake recipe. I just took different photos-of the whole cake, the strawberry layer, and a cut piece:) The cake is lemony! So pretty! A great summer cake. Delicious and Beautiful! Thank you. 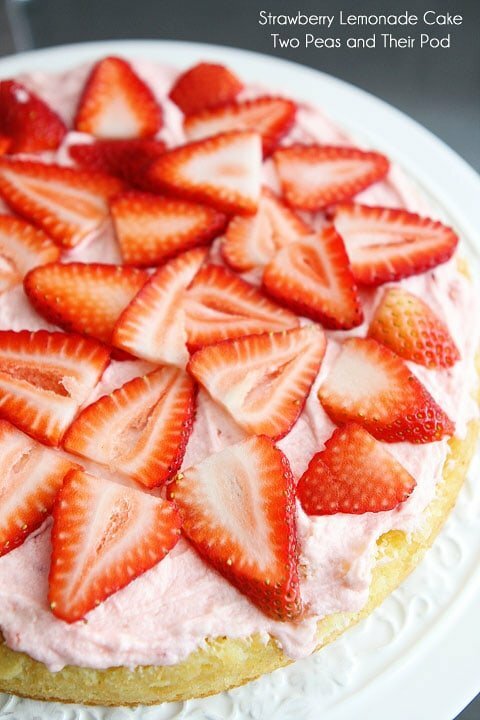 What a nice light, fluffy and fresh looking strawberry cake! This cake looks SO delicious! Perfect summertime cake. Wow! Two of my favorite things! Perfect for summer!!! Thanks for sharing! This looks so pretty & perfect for this time of year! yum! Looks delicious. . I want Heather’s cookbook! 🙂 thanks for sharing this recipe! love it! Not only is this cake beyond gorgeous, it has all my favorite summer flavors in one package! Perfection. Perfect summer cake, love it!! I bet this makes for a very tasty cake! And I agree layer cakes can be intimidating! I’m going to have to try this one. Looks divine. When I bake cakes I line the bottom of my pan with parchment paper and do not butter/grease the sides at all. This way the cake rises evenly (since it can “grab” onto the cake pan sides, which reduces the dome in the center), and I can run a spatula around the edges to release the sides of the cake. With the parchment, the cake slides easily out of the pan onto my cooling rack and I can then peel the parchment off the bottom of the cake. It’s so easy, and helps me not worry about tearing my cakes, too! This is beautiful, it looks so fresh and pretty! Love strawberries so much, I’m so glad it’s strawberry season here! Two great combinations…lemons & strawberries! Put them in a cake and you have a wonderfully sinful dessert! This cake looks so yummy. =o] I’ve been craving strawberries lately; the ones I’ve been seeing at the grocery store look so big and juicy. Perfect way to use some! Such a pretty summer cake! This cake is just so perfect for spring! It has spring flavors literally bursting forth from it! I love Heather’s book and have been eyeballing that cake! Now I know I have to make it! Yum! This is the perfect summer cake. What I lovely cake! The next occasion I can find, I will be making this! I love that there are fresh strawberries involved! So perfect for summer! That looks terrific for casual summer entertaining! This looks like summer to me! Can’t wait to see you soon!! I totally wanted to make this cake too. I opted for her Peanut Butter Caramel Corn- also a big hit! I can imagine how good this cake is. I mean, it totally just screams summer, I love it! Absolutely gorgeous, Maria and Josh! How perfect for summer! This looks amazing and fresh! Perfect for a hot summer day. That cake is GORGEOUS! I love strawberry lemonade and I love cake so its like the perfect combination! Looks aren’t everything though, the taste must be DELICIOUS! This is one of the best cakes ever made! I made this cake for a friend’s birthday yesterday and it turned out beautiful and delicious! I could barely taste the lemon and the cake had a consistency a little like pound cake. The frosting was divine! My son said it was the best cake he’s ever had! I asked if he wanted me to make it for his birthday and he said he couldn’t wait that long…how about next week!?! I requested this cake for my birthday and it turned out lovely, the only thing I noticed is that the cake wasn’t very lemony, if at all. Could have been an error on the baker’s part, but it was still delicious! SO gorgeous and I can only imagine how delicious!!! 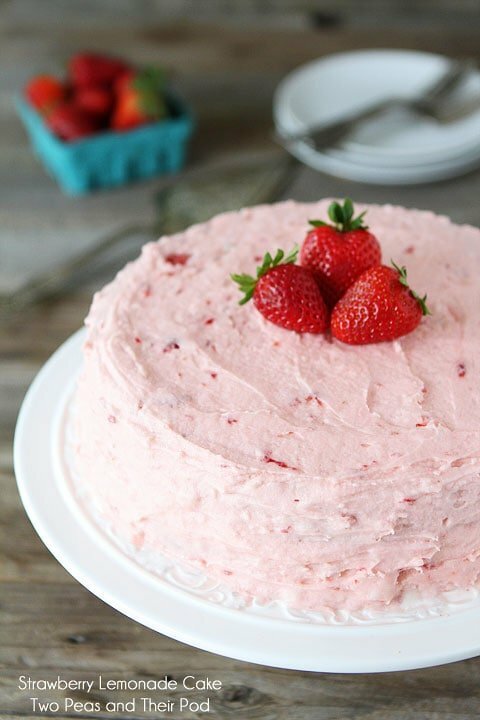 You had me at “strawberry buttercream frosting”. If this tastes as good as it looks then I can’t wait to try it! Could you do this as cupcakes? Yes! Just reduce the baking time. I haven’t tried it so I am not exactly sure on the time, just watch them. This looks so delightful! Question..I need to serve a few more than 12 people, could I make this cake in two 9×13 pans and layer it with that size? (I wouldn’t fill the pans with batter of course..) Thanks for sharing this recipe!! I haven’t tried making the cake in a 9×13 pan. To make 2 cakes, you might need to double the recipe. I was really disappointed with this recipe. Strawberries and lemon – two of my favourite things – together? Sign me up. The cake baked ok. I haven’t tasted it yet. But the icing was a DISASTER. I was following the instructions to a T but once I got to 4.5 cups of icing sugar I tasted it and it was waaaaaay too sweet. Disgustingly, inedibly sweet. I put in less milk than the recipe calls for, but it is still watery and drippy. I tried to put it on the sides of the cake but it just keeps slumping down to the plate. What a MESS! In general I like the concept and if the cake turns out ok I’ll try it again, but I’ll look somewhere else for a better icing recipe. I think I have everything else in place, but I’m missing that crucial (for me, at least) bit of info. Thanks in advance! 350 degrees, see step 1. Can these be made as cupcakes too? my icing didn’t turn out very well. I used icing sugar instead of powdered sugar. Isn’t it the same thing? Maybe that’s why it doesn’t look right. It’s not a smooth consistency, it didn’t whip at all in my mixer. I wonder what I did wrong. I’m going to now make a whipped cream icing, that hopefully will turn out well. Well, I didn’t bother making another icing and just went with what I made made. Waaayyyyyy to SWEEET!!!!!. The cake was dense and not at all what I had expected. Everyone said it was good. It was ok for the first couple of bites, but thereafter I couldn’t take the sweetness anymore. I think the people that made all those nice remarks haven’t tasted the cake because A) must be the author’s relatives, or B) are just going based on the picture. Don’t be fooled by these reviews, very disappointing cake. To Connie – I’m not an expert baker at all but I made this cake yesterday for my best friend’s birthday and it was incredible! She LOVES lemon anything so I actually added 1/2 cup freshly squeezed lemon juice (instead of 1/3), and I added a bit more than 2 tablespoons of the lemon zest. The cake was VERY lemony and I can’t imagine that little bit extra would have made such a big difference. As for the frosting, yes it’s sweet but the fresh strawberries had enough tartness to counteract it. You said it was runny, I’m wondering if you used frozen strawberries or fresh ones that were overripe? When I first creamed the softened butter and powdered sugar, it took awhile to get the thick, cookie-dough-like consistency. THEN I added the fresh, chopped strawberries THEN I added the milk. The frosting was soft and very fluffy. You MUST refrigerate the cake to set the frosting prior to serving or the frosting will slide down. Did you do that? I’m no relation nor had I ever heard of the author. The recipe is on Oprah’s website. My suggestion is to try it one more time and if you still don’t like it, well, rather than insult, perhaps you should just conclude that you just don’t like this cake. Preparing the meal together with your spouse can also be fun. fast food and fried chicken is very simple to make. Made this cake last night and husband was very impressed! Thanks for making me look good. : ) The cake turned out perfectly and the frosting, while a bit sweet, was just fine for a summer cake dessert. I’ve made a lot of food from internet posts, and this is the first time the food was so good that days afterwards I was daydreaming about it and remembered to go post about how good it was. I have made this recipe 3 times now and my family keeps requesting it, it is amazing! The presentation is wonderful but it tastes even better! Are you supposed to use salted or unsalted butter? Thanks! I use unsalted butter when I bake. Help! I just made this cake. It looks and smells delicious but I can’t get my frosting thick enough. I decided to frost anyway and it’s all sliding down the sides of the cake. I’m sure it still taste delicious but I was planning on taking it to church for Easter tomorrow. Any suggestions? Yes, you can use another berry! Enjoy! I just recently started following your blog…u r super creative. I like the look of this cake, however, I am allergic to eggs! Any recommendations to replace eggs and still make it as good as yours? This looks beautiful and delicious, Maria! I may make it for my upcoming birthday–I am very picky about my birthday cakes! Thank you for sharing. Making this for Fathers Day dinner! Layers today and frosting before church in the morn. Looks so good! My mouth waters thinking of how it will taste! This cake is fantastic! Don’t panic if the frosting looks too powdery before you add the milk (once you do, the frosting turns to creamy perfection)! I will make this cake again and again! Can I use vegetable oil in place of the butter? If so, how much? I haven’t tried making the cake with oil. How long will this cake keep for? I want to make it Wednesday night and serve it on Friday. It should be fine, just store it covered in the fridge. My good friend and boss’s birthday just came up — time to make a very special cake. 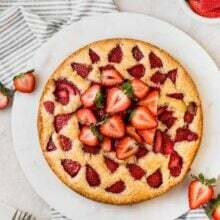 We have a farm and I wanted to use some produce from the farm in the cake so I was pretty excited to find this unique recipe that also contained strawberries! I make LOTS of cakes — I make a cake for all of my friends’s birthdays, whether or not they’re in the same state. The people around me reap the benefits! Anyways, this was by far — by FAR — the most-loved cake I’ve ever made! Eeeeveryone thought it was unbelieveable, even those that ‘don’t like cake’ and those that don’t like lemon desserts! You’re totally right, absolutely refreshing. I’ll definitely be making this one again. Thanks for sharing! I’d like to leave the strawberries out, not a fan. I know I can substitute with other fruit, but I would like to have zero fruit. Any suggestions on what I should change? Miam Miam, it was delicious. I wonder if I add cream cheese to the frosting next time. My 16-year-old daughter made this for Easter today. It was so delicious! Thanks for the great recipe! I can tell that we’ll be making this cake for years to come! It’s new favorite. Yay! Glad you liked the cake! Made this cake for the first time and wanted to report back my findings. 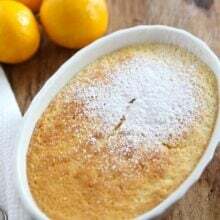 The lemon cake was made with the above recipe with the changes of using salted butter, just over 2 Tbsp lemon zest and 1/2 cup fresh lemon juice. For the frosting I used only 4 cups of confectioners sugar (unsifted). The batter was poured into a 9 x 13 glass pan that just had the bottom greased, baked at 350 for the first 25 minutes, then turned down to 335 for another 10 minutes. I am not an experienced baker by any stretch of the imagination but I have found that baking cakes/pies at 350 until cooked completely gives it an uneven texture as the sides are starting to dry out as I’m waiting for the middle to firm up. I loved the sponginess of the cake but the buttercream frosting is a challenge to me as both batches that I made “broke”. The first batch was put into the fridge. In both batches I used room temperature butter that creamed beautifully. The separation happened when I began adding the milk and strawberries. It is also possible that I overmixed it. My daughter and I learned that the frosting takes on more of the strawberry flavor so with the first batch I wanted to chill it to keep it from melting. After I took it out of the fridge I believe it broke as I stirred the chilled frosting, rather than letting it warm up to room temperature. However, with the second batch I didn’t chill but added the milk and strawberries and after a few minutes of mixing, it broke. Here is my buttercream rant for the day: This is maybe the third time I’ve made buttercream and it’s been a pretty daunting challenge for me. These delicious recipes make it seem so easy that any idiot can do it and offers no warning that buttercream is finicky. It’s not until the frosting breaks that you decide to google “why does my buttercream look grainy” or “why does my buttercream separate”. Heavens to murgatroyd! The cake portion of the recipe calls for strawberries, but the directions do not include what to do with them. Do you fold them into the cake batter? See step 7. You use them when the cake is done baking. Sorry about that; in the meantime, I went back and re-read the recipe and found the answer. That’s what I get for half-reading the recipe. I have two suggestions: Post on allrecipes (with a linkback here of course) so it can be found and rated, and clipped for those of us with memberships, and a cupcake conversion! I will be the first to give it 5 stars! I didn’t even get a slice since I gave it away, but when I evened my layers, I had a big paper thin piece with a spoonful of frosting. It is so buttery and delicious. I’m going to make cupcakes, and now I’m sad that I’m in Kansas and don’t get to use my grandma’s meyer lemons. What a great cake recipe! 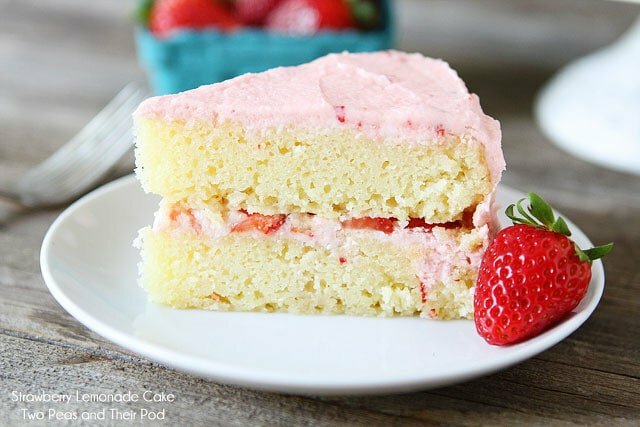 The cake has a great, fluffy texture with just the right amount of lemony kick and the strawberry buttercream is amazing! I could definitely just eat a bowl of the icing alone :-). Thanks for sharing! This cake is amazing. I made it for a co-worker for her birthday and the whole office raved about how good it was. Very light and refreshing for summer. The lemon makes it very tasty. Use fresh local strawberries if you can get them, I think it made a big difference. Plus it’s easy, that’s always a bonus to me. Beautiful, scrumptious cake!!!!!! Just perfect! It’s gobbled up at lightening speed every time I make it! wah!!! It is amazing!!! On my friend’s birthday I will recommend this cake to all my friends. Hello! I’m about to make this cake for my daughter’s birthday and am wondering if I should refrigerate overnight if I make it the night before? Thank you! It looks beautiful! That is fine, just remove it so it can come to room temperature before serving. I want to personally thank you for posting this Strawberry Lemonade cake recipe – I was asked by my very special niece to make her wedding cake for her wedding on June 2nd, 2018. And even though I’ve made quite a few wedding cakes in the past, for friends & family weddings, it’s been awhile since I’ve made a wedding cake, and was concerned that I didn’t really have a standard “go-to” recipe for her cake. 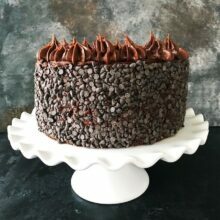 Plus, she gave me free rain to make whatever flavor cake I wanted for her – as long as it was a “Naked Cake and had 3 tiers” – so I was a bit overwhelmed, without a clue where to start! I spent 6 weekends trying different cakes, hoping for “the one” and most of them just left me frustrated – I even tried the recent Royal Wedding Cake, but I didn’t like the texture, plus it just didn’t wow me and give me the confidence that it would be a cake that would please the bride to be. Just 3 days, before the wedding (and when I needed to get everything together to start baking! ), I stumbled upon your recipe and let me just say, that after the first trial, I new it was going to be a winner!! The cake baked beautifully, it was easy to make and work with and packed a wonderful flavor! The only changes that I made to it, is that I made a lemon syrup, poked small holes into the cake and brushed the syrup on each layer before frosting it and adding the strawberries. Plus, because I needed the outside of the cake to be white, I made a buttercream lemon zest frosting for the outside which complemented the cake beautifully. It was a hit! Everyone loved it, it was so beautiful when it was sliced, that the crowd all ohhhh and ahhhh’ed about it, but most importantly, the bride and groom loved the cake, in fact she told me later that he doesn’t normally eat cake, but he was asking about it throughout the evening and wanted more cake! Fantastic cake! I made one for my daughter’s birthday, and everyone loved it. Made this for my friend’d BD. I was afraid it might be too sweet after reading the comments. It was delicious…sweet, but not too sweet. She loved it!